(CNN) -- Jess Allen, 33, is a freelance writer and works in the Learning & Development department at Barnes & Noble. 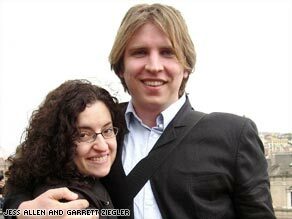 Garrett Ziegler, 29, works in educational assessment, and is completing a PhD in English at Columbia University. They moved to New York from Seattle six years ago and write a blog about the city called "We Heart New York." Jess and Garrett: "The sheer variety of great things to do here is electrifying." CNN: What are the best and worst things about living in New York? Jess and Garret: The best and worst things are the same: everyone wants to be here and the city changes both rapidly and constantly. The upside of this dynamism is diversity: there's always something new to do, something new to see. No matter what you want to do, someone else wants to do it too, which can be a marvelous antidote to the loneliness. But sometimes you just want to say, "Does there really need to be such a long line for this poetry reading?" CNN: Where do you like to go to get away from the bustle? J&G: We're big fans of the city's parks. Madison Square Park frequently has some type of art installation, plus there's an extremely active dog run. Hudson River Park has a lip of lawn that feels like a great green beach along with super views of New Jersey. Each month CNN visits the world's coolest cities with the celebrities who know them best. The southern end of Central Park is inevitably mobbed with tourists, but the northern end is comparatively deserted, completely lovely, and perfect for getting away without going away. We've seen eagles, bats and, once, a wild turkey. Indoors, we spend a lot of time in museums, where we seek out the calming, less-crowded spots like the musical instruments at the Met [Metropolitan Museum of Art], and at movies, where we can be alone with strangers. That's probably a requirement for living here: the ability to shut everything out and feel private in public. CNN: What do New Yorkers like to do at the weekend? J&G: Brunch, brunch, and more brunch. After that, it's up to you: parks, galleries, parties, shopping, meet ups, DIY happenings, rooftop movies, roller disco. Being bored really isn't an option. Saturday nights belong to suburbanites -- New Yorkers avoid bars and clubs then. In the summer, the upper crust heads out of town to the Hamptons or Catskills, which makes it a great time to stick around. CNN: Is New York still the most exciting city in the world? J&G: New York no longer has a monopoly on everything cool, certainly. If you want the next thing in art, you go to Beijing, Berlin or Los Angeles; if you want the next thing in food, you go to Tokyo, Barcelona or Copenhagen; if you want the next thing in fashion, you go to Mumbai, Hong Kong or Krakow. If you want all of those things at once, however, you still come to New York, and that's what makes it the greatest city in the world. Nowhere else could you see [street artist] Swoon artworks in your neighborhood, take the subway to a Colson Whitehead reading, have dinner at a place like Momofuku Ko, then go hear "TV on the Radio" on their home turf. The sheer variety of great things to do here is electrifying. What makes New York special to you? Sound Off below. CNN: What are the latest up-and-coming areas in New York? J&G: Greenpoint, Bushwick, and Bed-Stuy in Brooklyn, Long Island City in Queens, and the South Bronx. Though not up and coming, one of the neighborhoods that best embodies the spirit of New York right now is Fort Greene, Brooklyn, full of interesting restaurants, beautiful brownstones, newcomers and old timers, all centered around a great park and the very cool Brooklyn Academy of Music. We've also heard some rumblings about Manhattan. CNN: Has the city changed since 9/11? J&G: The couple of years afterward were probably more important than the actual event, insofar as people didn't flee the city in droves the way a lot of commentators predicted. The fact that people stayed and kept moving here was a vote of confidence in the city, in the romantic but worthwhile idea of New York as a place of universal refuge. CNN: If New York were a person, what would he or she be like? J&G: A guy in skinny jeans and flip flops chatting in Wolof on his iPhone while eating a hot dog and crossing against the light. Or maybe a woman in a sari and Louboutin heels walking a French bulldog, craning her neck to check out the skyscrapers, even though she's lived here forever, while crossing against the light.